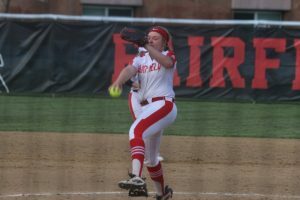 The varsity softball team was led by Senior Pitcher Hannah Miller’s perfect game in their win over Princeton 16-0 in 5 innings. This is only the 3rd perfect game thrown in the programs history, the last one was in 2008. Hannah sat every Viking down in order striking out 8 in the process. She was 3 for 3 at the plate with 3 RBI’s. Senior Kayla Wooton hit her first career home run, a 3 run shot in the 3rd inning. Senior Maddie Shaeffer had a double. Senior Lindsey Mitchell went 3 for 3 with a triple and scored 4 times. Junior Maiah Hodge scored 4 runs. The team travels to Harrison today and hosts Colerain tomorrow.